Posted on Thu, Feb 9, 2012 : 5:58 a.m.
Two weeks ago, nobody managed to pick every single game correctly to beat me. Last week, there was one person who managed to go a perfect 9-0, however. Sorry, I’m just that good. Two straight weeks with no winners in 'Beat Pete,' combined with the weather we’ve been experiencing, has me thinking the Mayans just may be right about this whole 2012 thing. Congratulations to Mark Musolf of Chelsea, who won the $20 Domino’s Pizza gift card. Don’t spend it all in one place, Mark. 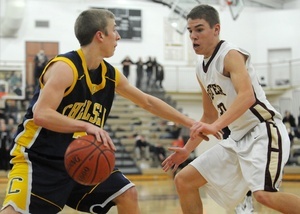 It seems like just yesterday we were talking about the Dexter-Chelsea, Huron-Pioneer rivalries. Well, it’s actually been three weeks and the teams are preparing to face one another again on Friday. Don’t think you can just look at the boxscores from the last time and figure out who should emerge victorious in round two of the rivalries. Take the Dexter and Chelsea boys game, for instance. When the two teams met at Dexter High School on Jan. 20, Dexter won 62-53 when Jay Lewis scored 24 points and couldn’t seem to miss for Dexter. Dexter is 1-4 since beating Chelsea three weeks ago while Chelsea has gone 3-2 in the that span. What Lewis did miss since is games -- four straight before returning in a loss to Temperance Bedford on Tuesday, as Dexter lost four of its last five. Chelsea, meanwhile, is 3-2 in that span with a last second 3-pointer loss to Lincoln and a loss to Ypsilanti (who should beat any team in the area). On the girls' side of the rivalry, the rematch lost a bit of its luster on Tuesday when Dexter fell to Bedford, 31-22. Now, instead of avenging its only loss of the season, Dexter will be trying to avoid its first losing streak against No. 9 ranked and undefeated Chelsea. The Huron girls team beat Pioneer by 27 points last month, so that pick may be obvious. But the boys game is a different story. Neither team has dropped a contest since Huron’s 42-41 win against Pioneer on Jan. 21 and the two are tied atop the Southeastern Conference Red Division standings with one loss apiece in league play. What more could either team hope for than a chance to take over first place against their biggest rival?